Stenhousemuir were hoping to build on the draw at league leaders Cowdenbeath. They were aware though that they would need to play a more expansive game on home territory. Whilst they were underdogs at Central Park they were definitely favourites for this game against the basement club Albion Rovers despite losing at Coatbridge only weeks later. Certainly since the turn of the year Stenhousemuir had done little to merit the favourites tag having lost to whoever was bottom on an alarmingly regular basis. Certainly in the opening stages it was the visitors that started best and Ally Brown was called into action to punch clear a Jack Werndly effort and then John Gemmell saw an effort go just wide of the post. It took the Warriors a while to settle down but eventually they began to create openings. The best of which came in the 18th minute when Kenny Deuchar and Andy Rodgers combined and the former’s half volley was parried clear by Derek Gaston though the striker will have felt that he should have put the Warriors ahead. Albion Rovers were not subdued however and Scott Chaplain saw a shot whistle just wide of the target. 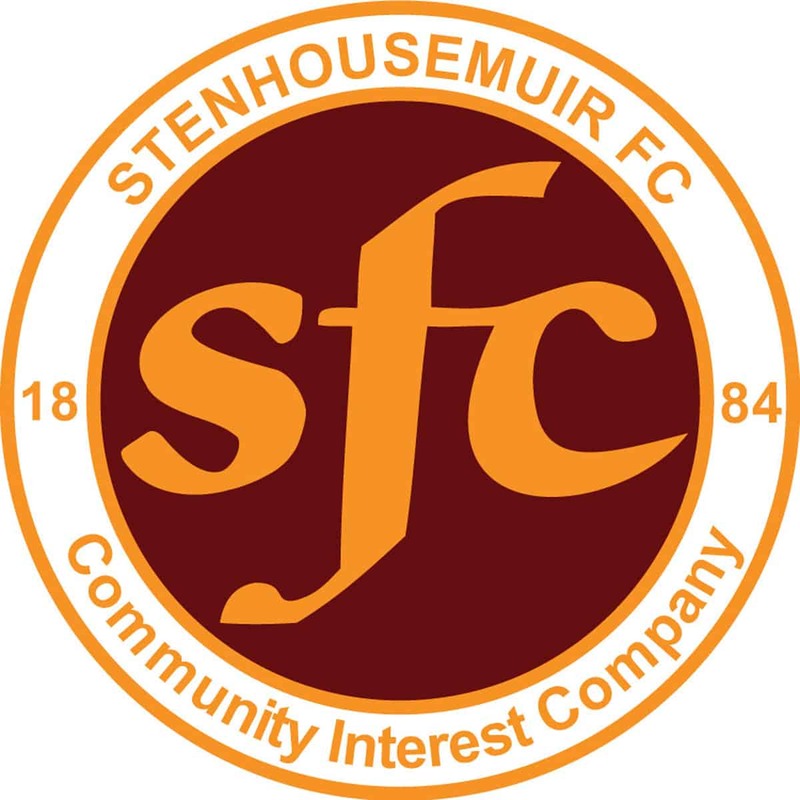 A minute later Stenhousemuir took the lead when Andy Rodgers hit an effort high into the net after the ball had fell to him fortuitously when a Paul McHale cross was not cleared and fell into his path. Albion Rovers had a call for a penalty in the 26th minute when Kevin McKinlay appeared to handle the ball whilst clambering over an opponent but luckily for the home side no award was forthcoming. It didn’t take long though for the equaliser to come with Werndly taking advantage of a misunderstanding between Willie Lyle and Ally Brown when there should have been no danger at all. The Warriors to their credit stepped up their game after this mishap and Stuart Kean and Andy Rodgers both came close with efforts. Stenhousemuir should have taken the lead in the 39th minute when a quick Rodgers free kick was played to Deuchar but despite only having the keeper to beat Gaston was able to deal with the shot with more than a degree of comfort. Despite this miss the Warriors could have went into the interval ahead as they had another couple of chances to take the lead but both went without reward. Michael Devlin had a decent header saved just after the resumption but it was downhill after that. In the 50th minute Albion Rovers were awarded a freekick that many felt should have been awarded the other way. This of course was of no concern to Ryan McStay who made the most of the award with a decent strike over the wall and into the net. This was a major blow for the home side and indeed Albion Rovers could have extended their lead though another McStay strike but this time Ally Brown made a one handed save. The Warriors were beginning to lose their discipline and a number of players were beginning to become argumentative and this brought about a rash of cautions. Their mood was not helped when a penalty was denied when a cross by Kevin McKinlay was cut out by a defender’s use of the hand and it got even worse when Andy Rodgers was hauled to the ground for what appeared to be a stonewall penalty but the referee thought otherwise. Comments were made from the bench and eventually goalkeeping coach David Woodward was sent to the stand. Although Stenhousemuir had their valid grievances Albion Rovers controlled much of the half and though there were several scares for the visitors before the end they held on fairly comfortably until the final whistle. This was a blow for Stenhousemuir in their attempts to keep in the play-offs but was also a personal disaster for Sean Fitzharris who was playing in his third trial game for the club. He was injured just after coming on as a sub and was unable to contribute before having to leave the field early. This was the second time he had been injured in his three games the previous time coincidently was also against Albion Rovers. Albion Rovers – Gaston, Reid, Russell, Stevenson, O’Bryne, McGowan [t][Marriott h/t], Love, McStay, Gemmell [b61], Chaplain and Werndly. Subs not used – Ferry, Gilmartin, McKay and Fahey.